This qualification sets out to ensure an in-depth understanding of payroll, and the complex payroll legislation involved, and also provides management skills including performance, time, project and operational management. The business management modules within the qualification will provide students with transferable skills such as performance, time, project and operational management. The Foundation Degree in Payroll Management also helps towards meeting the criteria in order to apply for Chartered membership. Why should I invest in this qualification? This qualification will provide increased confidence and knowledge in payroll, and help prevent penalties and fines for non-compliance. The work based project, and completed assessments, are based on legislation and your own organisation, which will improve knowledge and enhance transferable management skills, benefitting your role through improved efficiencies and effectiveness. Who is this qualification aimed at? Year one - Practitioner certificate in payroll, focusing on core principals of payroll processing and manual tax calculations. Year two - Advanced practitioner certificate in payroll looks further into payroll processing and specifically into statutory payments. Year three: Diploma in payroll management focuses on the more advanced payroll processing and strategic planning. The Foundation Degree in Payroll Management is delivered through blended learning. Each module consists of one module review day, which is face to face at specified locations throughout the UK, a two hour tutorial which will be provided either face to face or online based on your geographical location and home study through the HOW college student website. For employers with five or more learners, the course can be delivered on your site. For further information please email us. For more information on the costs, please call 0121 712 1023 or email us here. For year two or three enrolment forms, please contact our education team. Due to changes in HEFCE funding, students enrolling on the Foundation Degree in Payroll Management, Foundation Degree in Pensions Administration and Management and BA (Hons) in Applied Business and Management for the autumn 2012 intake onwards are eligible for student loans to assist with funding these qualifications. Student loans are available to all self-funding students in England who have not had a student loan previously. They are not based on, nor do they affect, your credit rating. Students living in Scotland, Wales or Ireland are not currently within the student loan process. Students looking for public support to assist with funding these qualifications should apply for a part time student grant from their respective government body. Students applying for a student loan must do so through the Student Loan Company. Application packs will consist of the part-time Tuition Fee Loan application form (for new students starting their course on or after 1 September 2012), along with notes and guidance to help students with their application, information can also be found here. To download a student loan application form, please the Student Loan Company website. Further information on student loans can be viewed here. If you are applying for a student loan for the Foundation Degree in Payroll Management you will be asked for the name of the institute. Please state Heart of Worcestershire College not the CIPP on your application form. Please contact the education team on 0121 712 1023 before completing the student loan application to obtain the correct information. I really enjoyed the first year of the CIPP degree and would recommend anyone who works in payroll to study the first year because you learn everything you need to know about operating a payroll, which prepares you for progression onto the next stage of study being year two. The support from CIPP has helped me gain the qualification with the use of the accreditation after my name (MCIPPdip). 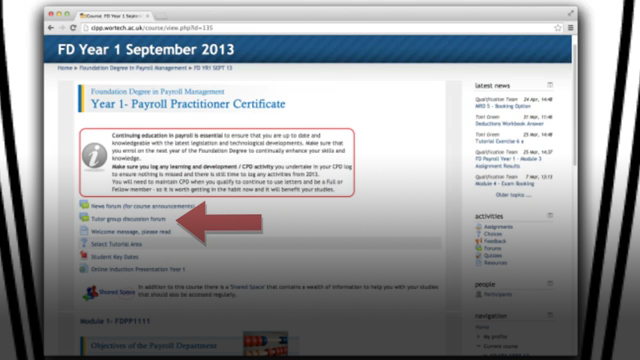 This has earned me the respect and trust from colleagues and clients, in the fact I am a qualified payroll professional.